Download Free Sportswear Sale Flyer PSD Templates. 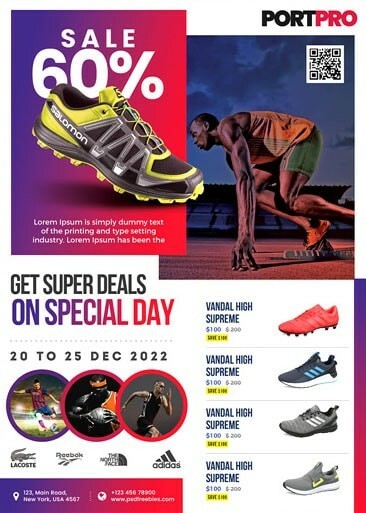 This Sportswear Sale Flyer PSD Templates is designed for almost any kind of Sportswear business, sports equipment, fitness clothing and other sports accessories. Freebie Included with 5 different color options. This Sportswear Sale Flyer PSD Templates download contains 3 A4 size, 300 DPI, print ready, CMYK, layerd PSD file. All main graphic elements are editable using Adobe Photoshop. This Sportswear Sale Flyer PSD Templates is available for Free Download.